Cleaning teeth – The baby – When the fun all starts! The cleaning of baby’s teeth actually starts with the cleaning of the parents teeth! When a baby is born their mouth is sterile. With life outside the baby “inherits” bacteria through contact with parents, mum’s skin through breast feeding, and all sorts of objects babies love to stick in their mouths. This can mean if a parent’s mouth is not cleaned well and has gum problems and decaying teeth, the baby will have a higher chance these bacteria colonizing their mouth. The situation will worsen once baby teeth start to appear at six months. These bacteria as explained in What is decay? The Beginning prefer teeth and gum site. This means the environment has changed to favour decay. The introduction of sweets early in life causes the taste buds in the mouth to change. The body adapts to the new chemicals and other tastes are not as well represented. This makes a baby and young child less likely to accept savoury food. A friend told me the story of how his 12 month baby went to a one year old birthday party and came home with a lolly bag. From that day on he found it difficult to give his baby savoury food. To misuse a saying “the baby’s got the bug”. Read our article, Diet is the key – the bad and the ugly. Sticky sweets foods, and melt in your mouth lollies such as “chuppa chups”, chocolates are creating an environment for decay. This can set up cravings for a diet based on sugar that can lead diabetes and obesity. Basically you are what you eat. The decay rate is rising in children, and in some sections of the population, at an alarming rate. Teeth arrive on the scene, usually the lower front teeth, at six months old. The environment of the mouth now changes as some bacteria can now adhere to the teeth. Use a small head tooth brush, moisten with water, and wipe the teeth. If possible use a mirror and sit behind the baby and clean the little “pearly whites”. This is an opportunity for the baby to see what is going on. 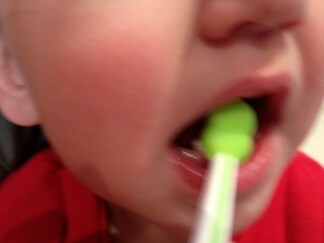 If bub does not like the tooth brush at first, then use gauze or a cotton bud to wipe the teeth. There is no need for toothpaste at this time as it will be difficult to see what you are doing. Cleaning the teeth is more important. It is difficult! Even taking a photo was difficult! Gradually over time they get used it. Once that happens use only a small amount of low concentration fluoride toothpaste. Toothpaste can froth up and be annoying to some babies. An alternative is to lay the baby in your lap so that they are facing up at you. This allows you see both upper and lower teeth (like a dental chair to a dentist) and will make it easy to clean the teeth. It may be more comforting to your baby as they can see your smiling face, showing how much you enjoy cleaning their teeth! Next in this series will be: Cleaning – The Toddler – Teeth are sprouting everywhere.